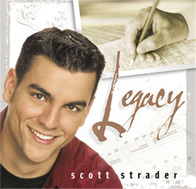 John W. Peterson and his grandson, Scott Strader, combined their musical talents to create this exciting CD. Featuring a timeless collection of songs from this prolific and respected composer, this release is a memorable blend of new songs and classic favorites with rich and powerful orchestral arrangements by Don Marsh. Moving and inspirational, this recording is truly part of a rich musical heritage . . . and a lasting "Legacy."